Rye whiskey used to dominate the Northeastern United States, but never recovered from prohibition. Now with the current craft spirits and Bourbon boom, there has been a revival in Rye whiskey as more and more distilleries have discovered its potential for cocktails and as a complex sipper. Come and try these highlights from our shelf! This Chicago favorite takes their Bourbon recipe and flips the ratio of rye and corn for a 70% Rye, 20% Corn, and 10% Malted Barley wash. Far more substantial than the anemic Ryes of years past, this backs off from the modern 95-5 spice bomb with just a touch of honey and orchard fruits. Splinter Group has made a name for themselves, and started a minor trend, by finishing their whiskeys in wine barrels. Aged in seasoned French oak instead of white American, Whipsaw blends stocks Rye that are up to 7 years old. After the whiskeys are blended, they are further finished in Selyem Pinot Noir casks and other Napa Cab barrels for a decadent and fruit forward Rye. Whistle Pig traditionally selects and blends high quality barrels sourced from MGP and other major producers, but it has always been their dream to have a product that was truly their own. Farmstock is the start of this evolution, slowly blending in their own Triple Terrior whiskey. Thirty percent of Farmstock #2 is whiskey that's made with Vermont grains, Vermont oak, and aged on their farm. Cedar Ridge is the 3rd highest selling whiskey brand in Iowa, but is vitrually unknown in Illinois. Most producers use artificial enzymes with raw rye grain, but Cedar Ridge uses Malted Rye in a process that lets the rye use its natural enzymes, toasting it as well. This leads to a breadier, more biscuity flavor like a Rye whiskey version of a Speyside scotch. Named after the practice of finding a promising young thoroughbred to raise up as your own, Pinhook is a sourcer of young barrels until they’re ready for the "big time." Each vintage is named after a winning horse and eschews a standard profile, that blends the best whiskey from their favorite barrels of the year. Try "Rye Humor" and "Bourbon 'n Rye" side by side before they're gone! 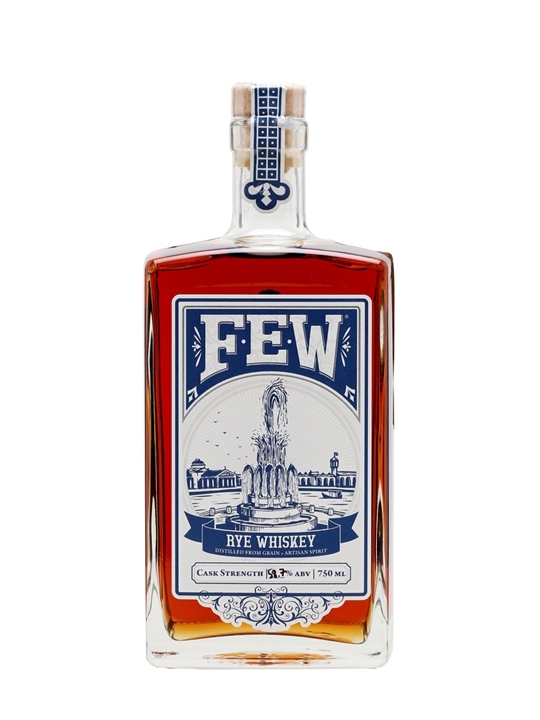 Old Forester has been making waves with the release of their new Rye Whiskey. Bucking the trend, Old Forester Rye has an unusually high percentage of Malted Barley at 20%, allowing a purely natural fermentation with nutty and brown sugar undertones. An up and coming entrant from Louisville, Rabbit Hole was founded by industry professionals who wanted to make a more artisanal whiskey. Their Rye emulates the ever popular 95-5, but is made in a far smaller still, generating lots of citrus and black pepper. Chicago’s Field Museum has been partnering with local breweries and distilleries to give Chicago’s palate a touch of history. For this collaboration, they’ve taken Journeyman's Last Feather Rye and macerated it with Black Mission Figs, one of the world’s oldest sweeteners. Don’t be thrown off by the vibrant color, the figs just contribute dark fruit to an already fantastic Rye. One of the few Bottled-in-Bond Ryes on the market, Rittenhouse is four years old and bottled at 100pf. Consisting of 51% rye, Rittenhouse is surprisingly fruit forward compared to the high ryes that have flooded the market, but with its proof, age, and low price it is a perfect introduction to Ryes. New by Bulleit, this is the same MGP 95-5 juice they use in their regular Rye, but aged a full 12 years! MGP 95-5 is one of the most sought after whiskies among both sourced distilleries and enthusiasts alike, and this 12 year old version is a steal. Come in for These Spring Deals!